CLAREMORE, Okla. – A commitment to rodeo fans in northeastern Oklahoma is a big reason for the success of the Will Rogers Stampede PRCA Rodeo. Members of the Professional Rodeo Association have taken note of that distinction, and it’s a key reason why they have recognized Claremore’s rodeo as the Small Rodeo of the Year in 2014 and 2015. A big part of that award-winning atmosphere is the overall production of the rodeo and the outstanding animal athletes that are part of the competition. Saddle bronc rider Jesse James Kirby of Dodge City, Kan., watches after bucking off Pete Carr’s Classic Pro Rodeo’s Spur Strap during the 2016 Guymon (Okla.) Pioneer Days Rodeo. Spur Strap is one of many Carr animals that have been selected to perform at the Wrangler National Finals Rodeo. 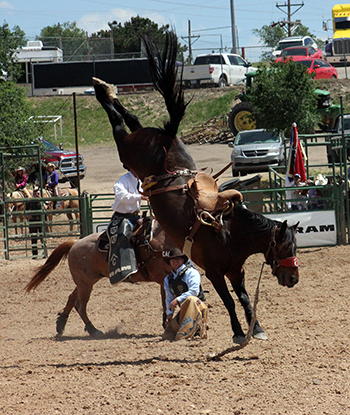 “Having Pete Carr Pro Rodeo as our producer has been a big part of our rodeo’s success,” said David Petty, chairman of the volunteer committee that organizes the annual rodeo, set for 7:30 p.m. Friday, May 27-Sunday, May 29, at Will Rogers Stampede Arena. Tickets are on sale through the event’s website, www.WillRogersStampede.com, and include family packs and adult passes offered at a significant discount online. The Stampede will honor its 70th anniversary this year with a grand celebration, from the Downtown Hoedown on Thursday, May 26, to concerts after every rodeo performance: Adam Hood on Friday, Cooder Graw on Saturday and Cody Canada and The Departed on Sunday. This year also marks the fourth straight season the Carr team has been part of Claremore’s rodeo production. It’s no coincidence that the Will Rogers Stampede has been named the top small rodeo two of the three years Carr has produced the event. Over the last three seasons, the Carr firm has had more animals selected to perform at the Wrangler National Finals Rodeo than any other livestock producer. There are 548 contestants that are scheduled to compete in Claremore this spring, which is a considerable statement to both the rodeo committee and the Carr team. The contestants know that, too.